Also Replaces Culligan® RFC-BBSA. This filter fits Culligan® HD-950A . This compatible whole house filter cartridge is spun from food-grade polypropylene that reduces sand, silt, scale, and rust particles in residential, commercial, and municipal drinking water. It also utilizes Activated Carbon to remove chlorine and odor. The filter has 3 layers, the outer layer has a 10 micron rating, the middle layer has a 7 micron rating and the inner layer has a 5 micron rating. The filter has an absolute 5-micron rating, which means the particle removal rate can be 95% or greater. Other brands often only have a nominal micron rating. This is not a Culligan®, GE® or Whirlpool® OEM product. The Culligan®, GE® and Whirlpool® brand names and logos are the registered trademarks of their respective owners. Any use of these brand names or model designations for this product is made solely for purposes of demonstrating compatibility. 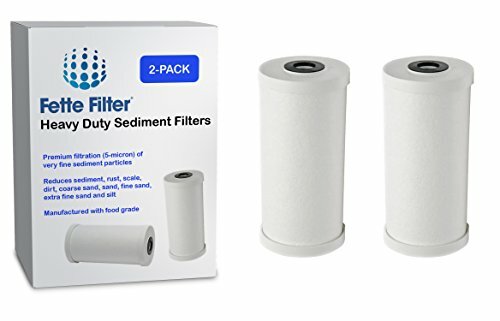 2-Pack GE® FXHTC Compatible Premium Heavy Duty Sediment Replacement Cartridge. Compatible with GXWH40L, GXWH30C, GXWH35F, GXWH38F, GNQH38S and most systems with 10" x 4.5" filters. Replaces Culligan® RFC-BBSA. Compatible with HD-950A. This compatible whole house filter cartridge is spun from food-grade polypropylene that reduces sand, silt, scale, and rust particles in residential, commercial, and municipal drinking water. It also utilizes Activated Carbon to remove chlorine and odor.